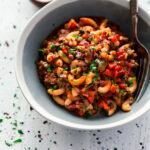 Just like Grandma used to make, some call this dish American chop suey, but in my neighborhood, there is nothing better than a good old-fashioned one pot American Goulash recipe. Perfect for slow-simmering on a lazy afternoon, this dinner features simple ingredients that come together quickly and in a single pot, making for easy prep and cleanup. Full of pantry staples and fresh vegetables, this American-style goulash is hearty, flavorful, and comfort food to enjoy all year long. Heat a large pot over medium-high heat. Add the ground beef and cook, breaking the meat up as it cooks, until browned, about 6 minutes. Add the onion, bell pepper, and carrot, and continue to cook, stirring occasionally, until softened, about 5 minutes. Add all the remaining ingredients, except the macaroni, and stir gently to combine. Cover, and let simmer for 20 minutes. Stir in the macaroni, cover once more, and let simmer for another additional 20 minutes, or until the macaroni is tender. Remove from heat, uncover, and let sit for 5 minutes before serving. Enjoy!